Watch Amazon Originals’ Jack Ryan with immersive Dolby Atmos surround sound. Play podcasts by saying “Play the latest Ted Talks podcast”. Create routines on the Google Assistant mobile app to do multiple actions with a single command. Twenty-five years after the bombs fall, you and your fellow Vault Dwellers emerge into post-nuclear America. Play solo or join together against the wasteland’s greatest threats. The Blue Bomber is back and must battle Robot Masters and take their powerful weapons for himself, changing our hero’s appearance with new levels of detail. It’s Open Season! Return to the wild and hunt across the globe in the world’s greatest hunting experience. Ask your Google Assistant questions. Tell it to do things. It’s always ready to help. With the new SHIELD Controller nearby, you can say “OK Google” or “Hey Google” to control your TV and your home without picking up a remote. Google Assistant is at your command, hands-free. Watch 360o videos or panoramic photos on your TV, complete with spherical camera control using your SHIELD remote or controller. VLC also adds Picture-in-Picture, so you can browse your SHIELD without interrupting your entertainment. The Eurosport Player lets you watch all your favourite sports coverage on your device, live and on the go. You can now rent or buy popular movies like Spider-Man: Homecoming in the highest 4K Ultra HD quality on SHIELD TV. 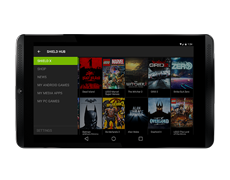 ITV Hub brings a world of entertainment to your NVIDIA SHIELD. It’s your place to get exclusive video and catch up on all your favourite shows. Don’t miss a thing! Enjoy an upgraded interface for voice search results that overlays on top of your shows, movies, and games. With Plex on SHIELD, you can now watch and record free over-the-air TV in up to 1080 resolution with 5.1 surround sound - and stream recorded shows to any device, anywhere in the world*. 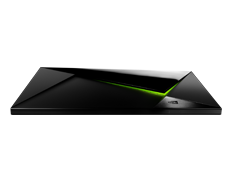 SHIELD TV now supports Hauppauge’s dual USB tuner (WinTV-dualHD-1590) for Plex Live TV. With Chromecast 4K built-in, you can now cast Netflix from your phone to SHIELD in 4K (YouTube 4K casting also supported). SHIELD welcomes the new Twitter for TV app and Vimeo.